Rev. Morais G. Quissico is the current Pastor of Epworth United Methodist Church in Bronx, N.Y. since early 2013. 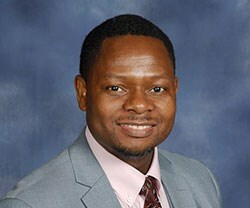 He serves as Vice-Chair of the New York Conference’s Connectional Ministries Vision Table. He also served as Chair of the Metropolitan District Council on Ministries; member of the New York Conference Committee on Nominations, and member of the North Eastern Jurisdiction Task Force on Global Structure. Quissico received a call to serve God early in his youth. As a teenager, he enjoyed singing and directing youth and adult choirs; organizing and leading Bible study classes with fellow middle and high school students, in rural Mozambique, Southern Africa, where he was born and raised. He was ordained Elder in 1994, after two years of successful full time ministry as an ordained Deacon, in the Mozambique South Annual Conference of the United Methodist Church. For more than two decades, God has used Rev. Quissico in multiple positions of transformational ministry in the life of the church and the society at large, worldwide. He was elected President of the Children’s Aid Society Policy Council and member of the Trustee Board of the Children’s Aid Society, in New York City; President of the Mozambique Council of Churches Disaster Relief Committee; Board member of the Habitat for Humanity International, in Mozambique; and a member of Technical Council for the Mozambique National Institute for Disaster Management. He pastored 3 United Methodist Congregations in Mozambique. Quissico is fluent in 9 languages. He serves as Language Interpreter and Language Translator for the UMC General Conferences, Central Conferences and other denomination events worldwide. He has traveled extensively in pursuit of the United Methodist mission work, as speaker at US Annual Conference Sessions, coordinating mission partnership roundtable consultation meetings in the USA, Africa and Europe. He has attended the Oxford Institute of Methodist Theological Studies in England, and the global student week in Iona Community, Scotland. For 7 years, Rev. Quissico served as the Executive Secretary for Africa, at the United Methodist General Board of Global Ministries, in New York; overseeing missionaries and mission work in Africa. For 5 years he coordinated the disaster relief work of the United Methodist Committee On Relief (UMCOR) in Mozambique. For 5 years he served as General Councilor for the Mozambique United Methodist Conference Youth. For 2 years, he served as the director and teacher at the Chicuque Bible School and Leadership Training Center, to equip the Mozambique conference with qualified local pastors and lay leadership. In addition to the four years of seminary education from the United Seminary of Ricatla, Rev. Quissico also holds a B.A. degree in Theology, from the University of Malawi; and a Master’s degree in Public Administration, from Baruch College, School of Public Affairs, City University of New York. His professional development studies include a Certificate on Technology of Participation and Group Facilitation; Certificate on Safety Net and Economic Development; Certificate on HIV/AIDS Chaplaincy; and 2 Certificates on the Management of Conflicts Development. The most precious gift in Quissico’s life is his wife Fatima, son Helton and daughter Vania.